An enterprise can gain differentiating value by aligning its master data management (MDM) and business process management (BPM) projects. This way, organizations can optimize their business performance through agile processes that empower decision makers with the trusted, single version of information. Many companies deploy MDM strategies as assurances that enterprise master data can be trusted and used in the business processes. IBM® InfoSphere® Master Data Management creates trusted views of data assets and elevates the effectiveness of an organization’s most important business processes and applications. 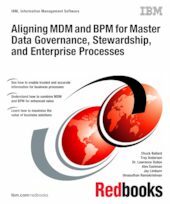 This IBM Redbooks® publication provides an overview of MDM and BPM. It examines how you can align them to enable trusted and accurate information to be used by business processes to optimize business performance and bring more agility to data stewardship. It also provides beginning guidance on these patterns and where cross-training efforts might focus. This book is written for MDM or BPM architects and MDM and BPM architects. By reading this book, MDM or BPM architects can understand how to scope joint projects or to provide reasonable estimates of the effort. BPM developers (or MDM developers with BPM training) can learn how to design and build MDM creation and consumption use cases by using the MDM Toolkit for BPM. They can also learn how to import data governance samples and extend them to enable collaborative stewardship of master data.